The motive which permeates all three movements of Chuck Holdeman’s Quatuor Excentrique is a short melodic phrase reminiscent of a soft, singable Arvo Pärt tune. But the composition premiered at the Second Annual Visual and Performing Arts Festival at West Chester has some Twenty-First Century harshness as well. The three-movement quartet was based on Holdeman’s 2001 composition, Divertissement, a piece which was commissioned by the Adirondack Ensemble which featured a balaphon – an African xylophone with about a dozen notes. Holdeman revised the Divertissement and added two other movements that he scored for violin, cello, marimba and bassoon. The Divertissement retains a classical quartet feeling, with a good blend and balance between the instruments. Sylvia Ahramjian played violin facing the back of the stage to avoid overpowering the bassoon played by Holdeman. Chris Hanning kept the marimba extremely pianissimo through most of the movement, allowing Ovidiu Marinescu’s smooth cello sound to come to the forefront. The second and third movement kept the same theme, but the second (Mélancolique) was muted and doleful while the third movement (Outré) ended in a jazzy and wild frenzy, with Marinescu and Holdeman playing dueling bassoon/cello and Chris Hanning seemingly playing the entire marimba keyboard at once. Holdeman commented, “I was very grateful to the West Chester players for this opportunity to revisit the tune which opens the quartet, not only to hear it again, but to permit it to go in new directions. And I always felt the Divertissement was a little too short, and perhaps lonely. Now it has two companion movements." 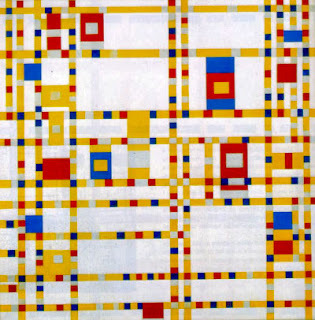 Delaware artist Wes Meminger was at the premiere and compared the third movement to a work by Piet Mondrian entitled Broadway-Boogie Woogie (see above). Holdeman is in residence for the rest of September at the Virginia Center for the Creative Arts supported by a grant awarded to a Delaware artist by the Mid-Atlantic Arts Foundation of Baltimore.